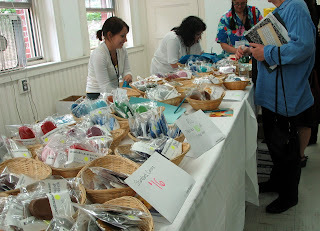 I’m not the best person to attempt a report of the First National Conference of Encaustic Painting , which took place June 8-10, at Montserrat College of Art in Beverly, Mass. As the conference founder I’m unashamedly skewed in its favor, but I’ll give it a try. As with my BaselMiami reports, I'm offering you a biased, myopic and journalistically suspect look at the events--with pictures. Thursday This part is not connected to the conference proper, but it involved conferees. I invited about 30 artists who had taken a Master Class or consult with me to come to my Salem loft (about three miles from the college) for wine and cheese. About 25 folks showed up. Although I knew everyone, initially many folks didn’t know one another. This was not true by the time we left en masse for dinner two hours later, when 25 friends walk together to the Thai restaurant downtown. Fun! It was worth having spend two days cleaning up for the party. Later a few diehards returned chez moi for a last glass of wine. FridayRegistration was scheduled for 3:00 pm, so many of the conferees who arrived on Boston's North Shore early found their way to the Peabody Essex Museum in Salem, where a Joseph Cornell exhibition, organized by PEM curator Lynda Roscoe Hartigan, was featured. I went for a bike ride as I knew it would be the last exercise I’d have for the next several days. Registration: Around 3:00 p.m. conferees started streaming into Montserrat’s Hardie Building. Everyone got a folder with maps, color-coded schedules and presenter bios. And a pair of red wax lips. "Hot Stuff": At 4:00, the doors to Montserrat’s 301 Gallery were unlocked for the opening of "Hot Stuff," juried by Zola Solamente, director of Boston’s Arden Gallery. The entry process had been open to participants of the conference. 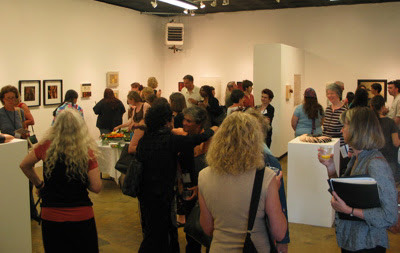 Thirty-two artists and 48 works were selected. The show, open to the public, was impressive for the range and quality of the work—limited to 30 inches to allow for a greater number of selections—and the installation was superb. 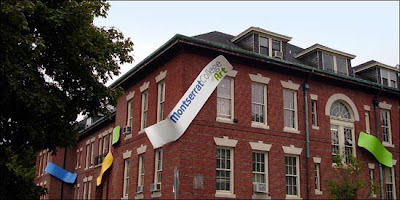 Montserrat's outgoing president, Stan Trecker, was impressed with both the esthetic level of the work and the passion of its makers, most of whom were in attendance. Laura Tonelli, Dean of Faculty, noted the work of Debra Ramsay, elegantly reductive colorfields in pale aqua and ivory that incorporate a cracked eggshell intarsia as a textural element. Norman La Liberte, a painter and friend of Montserrat, purchased a painting by Linda Womack.
. Diana Gonzalez Gandolfi’s small paintings with almost pictographic symbols suggesting familiar but ultimately mysterious narratives. My Keynote: Hey, the founder gets to give the talk—at least this year. My topic, "Almost Mainstream After 2000 Years," focused on encaustic history—ancient history, current history, and the space in between. Before the lights dimmed for slides, I talked a bit about having visited Jasper John’s studio in 1986, back when encaustic was, as he put it, "an archaic medium." 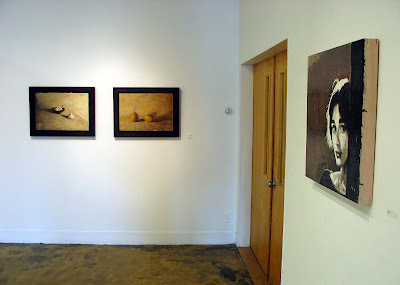 I showed images from ancient history, jumped to John’s paintings from the Fifties, jumped again to the Seventies and Eighties with paintings by Kay WalkingStick, Rachel Friedberg and Michelle Stuart, and then showed work from the past few years. The medium is what links us, but it is our individual vision that sustains the work, wax or no wax. That's me giving the keynote, "Almost Mainstream After 2000 Years." My theme was ancient history, contemporary history and the history in between. The image above is of a krater, circa 350 B.C., at the Met which shows a painter applying encaustic to a marble statue of Herakles. Did you know that most Greek marbles were polychromed? The image below is a work from 1955 by--oh, come on, you know who. Things started moving faster on Saturday morning, fueled by enthusiasm and caffeine. 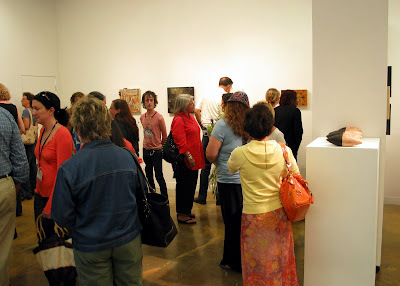 "Encaustic: State of the Art" This was the only event scheduled for its time slot--Saturday morning--so we had a full house. The panel addressed issues in contemporary encaustic, from content versus medium, to how work in this medium is packed and shipped. 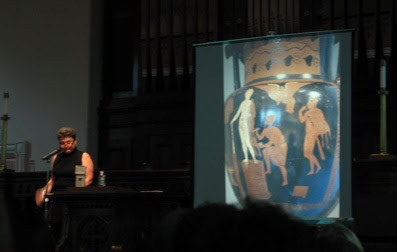 Barbara O'Brien, critic and curator, broke the ice when she said that until she was asked to be on the panel, she hadn't really thought much about encaustic. She'd had some inchoate ideas about it being somehow secondary in the hierarchy of painting, so she was surprised to see the quality and variety of good work being done in the medium. In that regard, she said, "I guess it's like racism. I was being racist about encaustic." 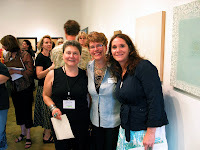 Katherine French does know about encaustic--she's shown work in the medium at the Danforth Museum where she is director. Her dialog with O'Brien about content and concept, rather than medium, was a jolt for some artists who are focused on the waxness of their work, but for others it was a welcome discussion. "I was so relieved that we could put the topic of 'art first, wax second' on the table and discuss it," Deb Ramsay, a painter from New York City, told me later. As a Newbury Street gallerist, Hope Turner, owner of Arden Gallery, shows encaustic painting regularly (disclaimer: I'm represented by Arden) and deals with both conceptual and physical content. This is true, too, for Timothy McDowell who shows his paintings regularly in galleries around the U.S. and Canada. Both offered advice that acknowledged the commercial aspect of gallery representation--including the importance of archival preparation of the work. Richard Frumess, a painter and paintmaker, reminded us that commercially made encaustic paint has been widely available for only a couple of decades. Frumess's company, R&F Paints, has been a major factor in the expansion of encaustic. Frumess himself is looking forward to letting his company take over more of the reins so that he can get back to his own painting. Referring to the content versus medium discussion we'd been having all morning, he said to the audience, "I hope you'll understand, when I do go pack to painting, if I end up working in something other than encaustic." There was also plenty of nuts-and-bolts advice for artists on how to present themselves and their work. Katherine French offered a cautionary tale--and provided a good laugh--as she recalled the artist who had called her to set up an appointment to view work and schedule a show (!) The artist explained that she was busy, so she wanted to schedule both a studio visit and an exhibition right away. Taken somewhat aback but responding to the chutzpah, French asked the artist what she liked about the museum. "Oh, I'm too busy to visit the museum," the artist responded. Deadpanned French: "She didn't get a show." French did offer this sound advice, which I'm paraphrasing, and which is applicable when dealing with curators and dealers anywhere: "Come to the openings. Introduce yourself. Let me see that you know the museum. Let me get to the point where I recognize you. We're booked for the next two years, and I have a stack of 400 packages that have come in since the beginning of the year, which I've been too busy to open. But if you've broken the ice and ask me to look at your work, I'll be more inclined to do so." After the panel, choices got more complex. When I planned the schedule, I was thinking of the CAA model--multiple choices in the same time slot. So the afternoon offered two options: A technical panel or a series of three demonstrations. The Technical Panel: "Wax, Paints, Substrates and Grounds"
This panel brought together experts in material matters: John Dilsizian, president of Dilco Refining (now part of Strahl & Pitsch), the man I fondly refer to as "Dr. Wax"; Hylla Evans, painter and paintmaker, founder of Evans Encaustics; Rodney Thompson, painter and panelmaker; and Ed Angell, multimedia font of wisdom who operated the largest privately owned prop house in Hollywood before retiring to make his own art. Forty artists took note--and took notes--as panelists discussed topics like temperature, ventilation, archival issues, and the best ways to mix materials (yes, some artists make their own paint, and who better to offer information than the foks who make it?). There was disagreement (disagreement is good!) about the safety of wax at melting temperatures and the best ways to deal with safety issues. John Dilsizian summed up the tone of the proceedings when he said, "I've found that the general rule with artists is that they don't like general rules." 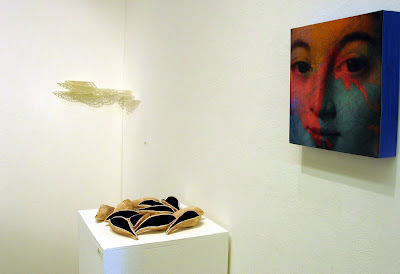 Later in the afternoon a series of informal talks took place at the 301 Gallery. 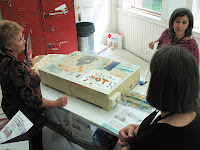 Alexandre Masino, Diana Gonzalez Gandolfi and Anne Cavanaugh talked about their work in the "Hot Stuff" show. Here’s where it gets hot and heavy: three successive time slots, each with three simultaneous events. The CAA model of multiple offerings means there are many good choices. The good news: you’re sure to find something that interests you. The bad news: everything interests you and you have to choose. Here, you have a glimpse of each event..
Paula Roland showed slides of work that she didn't have time to show in her workshop, and Sara Ashodian gave us a glimpse of several workshops she attended. For those of us who didn't attend those particular events, it was great to see what went on, and for those who did, the images offered a different perspective of the goings on.